WhatsApp will add free voice-call services for its 450 million customers later this year, laying down a new challenge to telecom network operators just days after Facebook Inc scooped it up for $19 billion. Buying WhatsApp has cemented Facebook's involvement in messaging, which for many people is their earliest experience with the mobile Internet. Adding voice services moves the social network into another core function on a smartphone. On Monday, Chief Executive Mark Zuckerberg defended the price paid for a messaging service with negligible revenue. He argued that rival services such as South Korea's KakaoTalk and Naver's LINE are already "monetizing" at a rate of $2 to $3 in revenue per user per year, despite being in the early stages of growth. Media reports put WhatsApp's revenue at about $20 million in 2013. "I actually think that by itself it's worth more than 19 billion," Zuckerberg told the Mobile World Congress. "Even just independently, I think it's a good bet." "By being a part of Facebook, it makes it so they can focus for the next five years or so purely on adding more people." WhatsApp's move into voice calls is unlikely to sit well with telecoms carriers. WhatsApp and its rivals, like KakaoTalk, China's WeChat, and Viber, have won over telecom operators' customers in recent years by offering a free option to text messaging. Telecom providers globally generated revenue of about $120 billion from text messaging last year, according to market researcher Ovum. Adding free calls threatens another telecom revenue source, which has been declining anyway as carriers' tweak tariffs to focus on mobile data instead of calls. Since the advent a decade ago of Skype's voice over Internet service, which Microsoft Corp has acquired, and the rise of Internet service providers like Google Inc, telecom bosses have gotten used to facing challengers whose services piggyback on their networks. But carriers complain that the rivals are not subject to the same national regulations. Mats Granryd, the CEO of Swedish mobile operator Tele2, said he was happy to partner with the likes of WhatsApp because of the additional data traffic they generate. But he shared the concerns of other network operators that they must operate under strict national regulations that Internet companies are not subject to. "They (Internet firms) need to be regulated a little bit more and we need to be regulated a little bit less," said Jo Lunder, who heads Russian mobile network operator VimpelCom. Vodafone CEO Vittorio Colao said he did not understand how such an important acquisition as the Facebook-WhatsApp deal could go unchallenged at a time when European network operators were facing intense regulatory scrutiny. "These types of deal are a clear indication that the world is changing and the regulations don't fit anymore," Colao said on the sidelines of the conference. 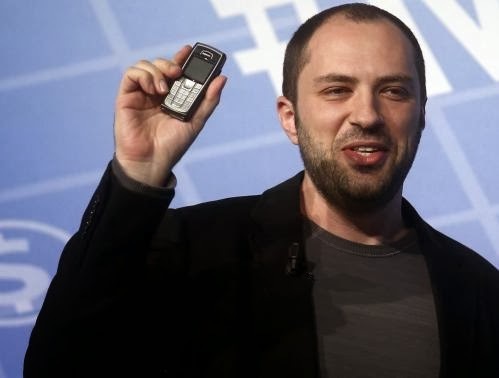 Both Facebook and WhatsApp CEOs have cast themselves as partners to telecoms network operators. On Monday, Koum also announced a partnership with E-Plus, the German subsidiary of Dutch group KPN, under which it will launch a WhatsApp-branded mobile service in Germany. The European Parliament is set to vote on Monday night on a package of proposed telecoms market reforms which among other provisions would restrict the ability of carriers to charge internet companies like Facebook to give them an enhanced service in handling their network traffic.